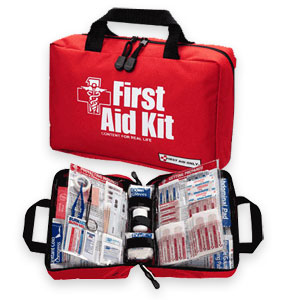 All workplaces, sports centers, homes, and cars should have first aid kits. The kits for workplaces or sports centers must conform to legal requirements, they should also be clearly marked and easily accessible. For a home or car, you can either buy a kit or assemble first aid items yourself and keep them in a clean waterproof container. Any first-aid-kit must be kept in a dry place, checked and replenished regularly, so that the items are always ready for use. The contents of certain first aid kits will differ greatly depending on certain factors. Is the First aid kit intended for the workplace or home use? Is the first aid kit intended for a specific activity or event? How many individuals will the first aid kit serve? These questions must be answered before your first aid kit can be adequately stocked. Since there are not an specific product requirements for home first aid kits, you’ll have to be smart about the specific items you choose to stock. Look for a variety of quality components and make sure you have all of your bases covered. Most of our recommended suppliers will be able to give you some great advice as to how to stock them based on your specific needs. Most have kits already assembled for most injuries you’ll come across at home. Standards have been set for the work environment by the OSHA. The OSHA or (Occupational Safety & Health Administration) is a sub-agency of the US Department of Labor. It issues standards to segments of the work force and polices these regulations. The purpose of these standards is to insure workplace safety. OSHA requires adequate first aid supplies to be available in the workplace but they don’t require any specific contents. This is where the ANSI (American National Standards Institute) comes in. As per ANSI standard (ANSI Z308.1-2003) “Kits in compliance with this standard will provide a basic range of products to deal with most types of injuries encountered in the workplace. The assortment of required contents was developed based on treatment for the following potential injuries: major wounds, minor wounds (cuts and abrasions), minor burns and eye injuries. It is important to note that each workplace is unique and, as such, additional first aid products should be selected to augment required contents based on the particular work environment” For a detailed list of the requirements set forth by ANSI Z308.1-2003. Please take a quick look here. Below is an example of the different categories of risk. Make sure when purchasing a first aid kit you not only determine the amount of risk but also the number of individuals it will be used for. Even minor injuries can become big problems in the backcountry. “The same things that happen to us in the front country happen to us in the backcountry, they’re just harder to manage,” says Shana Tarter, assistant director of the Wilderness Medical Institute at the National Outdoor Leadership School in Lander, Wyo. There’s also the worry that events will cascade into bigger problems if poor decisions are made. “In the backcountry, the domino effect of your choices is huge,” she says. Wilderness First Aid courses, such as the one WMI teaches, help students learn how to deal with minor and major injuries to help stabilize patients and avoid further injury. “We teach students to make the tough decisions,” Tarter says. “We do a lot of scenarios, that’s where we spend our educational time with our students”. Maybe not so surprising, the most common injuries during outings are pretty minor. And gastro-intestinal irritation such as diarrhea, cramping and gas. Infections are probably the most surprising problem because cuts can infect rapidly overnight,” Tarter says. The key to cleaning out wounds is an inexpensive syringe, she says. It’s one tool that’s difficult to improvise in the woods. With a syringe, wounds can be washed out under high pressure using disinfected water. “It’s the pressure that makes the biggest difference,” Tarter says. What other first-aid devices should backcountry users pack? An anti-diarrheal such as Immodium. Some type of first-aid reference manual. The best scenario, Tarter says, is when the injury is minimal enough to allow the victim to walk out of the backcountry, avoiding having to carry them or leave them to go get help. Or an even better scenario is preventing an injury, Tarter says. Blisters are probably one of the most common problems people face while recreating in the woods or on rivers. Given the unsanitary environment, they can quickly escalate into more serious injuries if not properly treated. Clean the area with soap and water. To prevent the skin from pulling off, build an elevated donut around the blister to the height of the blister using tape or moleskin. Shana Tarter of the Wilderness Medicine Institute says if the skin is pulled off to treat it like an open wound. Wash the area and apply an antibiotic ointment before bandaging. Clean it twice a day. Diarrhea, another common problem, can be easily avoiding by staying hygienic. Don’t share your water bottle or use your personal spoon to stir the community pasta. Wash after going to the bathroom. “GI bugs get passed around very fast,” Tarter says. The best way to treat it, if possible, is to rest and stay hydrated, she says. The WMI offers seven courses, everything from 180 hour wilderness EMT training to the 16 to 24 hour wilderness first aid course. For more information, log on to www.nols.edu/wmi.